"I would like to welcome you to Carnegie Hall, the world's most famous concert hall to hear an entirely different kind of music, a loftier melody. It's a more eternal song. There are two kinds of music. One comes from the strings of a guitar, the other from the strings of the heart. One sound comes from a chamber orchestra, the other from the beating of the heart's chamber. One comes from an instrument of graphite and wood, the other from an organ of flesh and blood. This loftier music I speak of tonight is more pleasing than the notes of the most gifted composers, more moving than a marching band, more harmonious than a thousand voices joined in hymn and more powerful than all the world's percussive instruments combined. That sweet sound of love. Just a generation ago, it was this sound that could be heard in every turn in every town. It was the sound of love that echoed in the living room when a father giggled with his son or a mother tickled a small infant child. It was the sound of love that echoed from children's literary classics as the parents read children dreamy tales before they went to bed. And it was the sound of love that reverberated in their dinner conversations. Between parents and children, not just once a year over turkey and stuffing but everyday for peace and prosper. Sadly, that sound has become a lost melody, a forgotten refrain, an empty tune and all we have in its place today is a dark and terrible noise. Instead of dinner conversations, there is the noise of video games. Instead of homework there is the din of the evening news. And instead of regular conversations between parents and children about drugs and violence, there is the deafening sound of silence. Who among us would have believed that the sound of children at their playgrounds would be replaced by the sound of automatic machine-gun fire at our schools? That the sound of little girls skipping rope would be overshadowed by the frantic squeals of children dodging bullets? Yet, instead of loving our children more, we install metal detectors in our schools. Are we blind to the fact that our children are raging against the indifference, crying out against the abandonment or thundering against the neglect? 'Heal The Kids' is about doing something, about making a difference and trying to help adults and parents realize that it's in our power to change the world that our children live in. As a wise man once said, "If not us, then who; if not now, when?" My friends, with two children of my own, I know what it means to have to balance the demand of family and career -- let's not even talk about finding a date for myself, even though Rabbi Shmuley keeps telling me he's going to find me the perfect woman. My response is, "As long as it's not a journalist." But learning how to strike this very necessary balance is what this special evening is all about. In three weeks time, at Oxford University I will be delivering an address with strong implications for dealing with the parent-child relationship and it's an address that is certain to surprise you. Until then, I want to thank you all for coming out, showing your love. And I want to offer a couple of special thank-yous. I'm overjoyed that we have 100 New York City teachers with us. I want to thank Steven Shaunfeld, he's a wonderful, wonderful man. Everything he does for 'Heal the Kids' is just incredible. 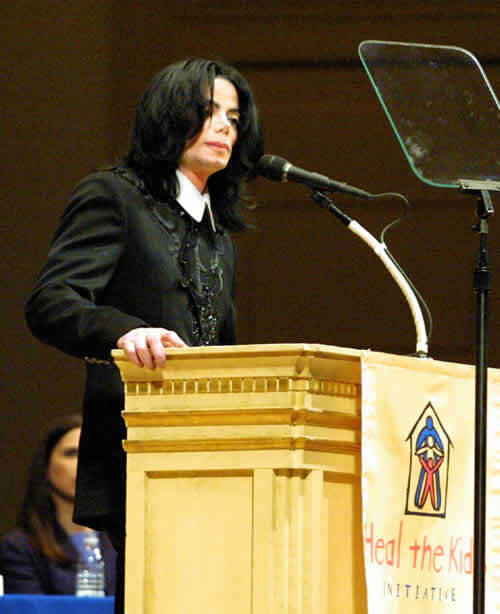 Together we can make a change for the better; together we can heal the world and make it a better place. God bless you all, I love you all." I want to thank you for participating. I truly hope that the thoughts expressed tonight will inspire all of us to love our children with all our hearts and souls. I would now like to take a moment to express my thanks to our participants. God Bless you all and I hope to see you at Oxford."